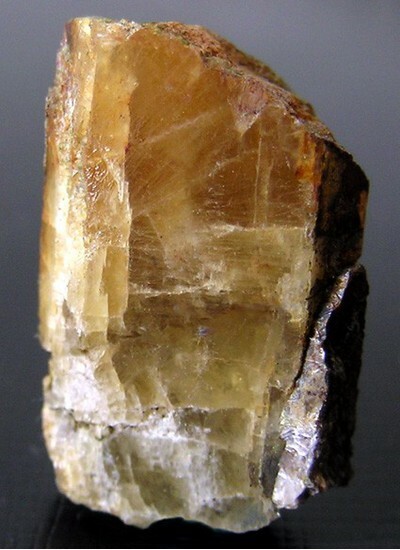 Heliodor: Mineral information, data and localities. 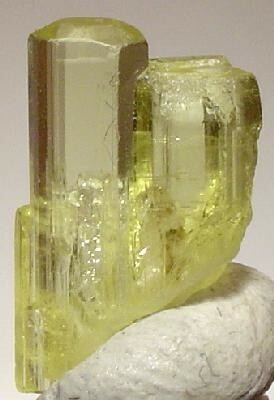 Originally applied as a trade name for "Golden Beryl" from Rössing, Namibia (Kaiser, 1912). Now in more common use for any gem-quality golden-yellow beryl. 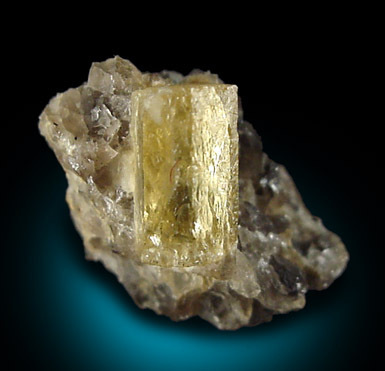 A golden yellow gem variety of beryl. Visit gemdat.org for gemological information about Heliodor. Aquamarine 42 photos of Heliodor associated with Aquamarine on mindat.org. Muscovite 16 photos of Heliodor associated with Muscovite on mindat.org. Schorl 12 photos of Heliodor associated with Schorl on mindat.org. Albite 8 photos of Heliodor associated with Albite on mindat.org. Quartz 8 photos of Heliodor associated with Quartz on mindat.org. Smoky Quartz 5 photos of Heliodor associated with Smoky Quartz on mindat.org. Beryl 4 photos of Heliodor associated with Beryl on mindat.org. Columbite-(Fe) 3 photos of Heliodor associated with Columbite-(Fe) on mindat.org. Fluorite 2 photos of Heliodor associated with Fluorite on mindat.org. Columbite 2 photos of Heliodor associated with Columbite on mindat.org. S.L. Penfield (1888): Amer. J. Sci ser. 3, 36, 317. Kaiser, E. (1912): Eine neues Beryll (Aquamarin)-Vorkommen in Deutsch-Südwestafrika. Centrbl. Mineral etc., 1912, 385-390. The following Heliodor specimens are currently listed for sale on minfind.com. Von Bezing, L., Bode, R., and Jahn, S., (2008) Namibia Minerals and Localities. Edition Schloss Freudenstein, Bode Verlag GmbH, Haltern. 490 pp (in English). Von Bezing, L., Bode, R., and Jahn, S., (2008) Namibia Minerals and Localities. Edition Schloss Freudenstein, Bode Verlag GmbH, Haltern. 288 pp (in English). Cairncross, B. (2004) Field Guide To Rocks & Minerals Of Southern Africa: 49. Ware, J. W. (1935), Gem Mining in San Diego Co., California: Precious Blue Topaz; Gems & Gemology, Vol. I, No. 8, March-April, pages 218-219; 240pp. Kunz, G. F. (1905a), Gems, jeweler's materials, and ornamental stones of California. California State Mining Bureau bulletin 37; p. 49. Kunz, George Frederick (1905a), Gems, jewelers’ materials, and ornamental stones of California: California Division Mines Bulletin 37, 171 pp. : 49; Murdoch, Joseph & Robert W. Webb (1966), Minerals of California, Centennial Volume (1866-1966): California Division Mines & Geology Bulletin 189: 103. Jahns, R. H. and Wright, L. A. 1951. Gem and Lithium-bearing pegmatites of the Pala District, San Diego County, California. California Division of Mines special report 7A: pages 59-61. Kunz, George Frederick (1905a), Gems, jewelers’ materials, and ornamental stones of California: California Division Mines Bulletin 37, 171 pp. : 52; Murdoch, Joseph & Robert W. Webb (1966), Minerals of California, Centennial Volume (1866-1966): California Division Mines & Geology Bulletin 189: 103. Kunz, G. F. 1905. Gems, jeweler's materials, and ornamental stones of California. California State Mining Bureau bulletin 37: p. 50. San Diego Mining Company, 2000. Rocks & Min. : 70:379; Elwell, Wilbur. (1937): Some Old Localities in Connecticut. Rocks and Minerals, vol 12, no. 9, pp. 270-1. Shelton, William. (1967): Notes on a Find at Haddam. Rocks and Minerals: 42(7): 502-503. Cameron, Eugene N., Larrabee David M., McNair, Andrew H., Page, James T., Stewart, Glenn W., and Shainin, Vincent E. (1954), Pegmatite Investigations 1942-45 New England. USGS Professional Paper 255.; Schooner, Richard. (1958), The Mineralogy of the Portland-East Hampton-Middletown-Haddam Area in Connecticut (With a few notes on Glastonbury and Marlborough). Published by Richard Schooner; Ralph Lieser of Pappy’s Beryl Shop, East Hampton; and Howard Pate of Fluorescent House, Branford, Connecticut. Harold Moritz collection; Seaman, David W. (1947): Reminiscing On Collins Hill, Portland, Conn. Rocks & Minerals, vol. 22, no. 8, pp. 732-3. Cameron, Eugene N., Larrabee, David M., McNair, Andrew H., Page, James T., Stewart, Glenn W., and Shainin, Vincent E. (1954): Pegmatite Investigations 1942-45 New England; USGS Professional Paper 255: 333-338. Cameron, Eugene N.; and others (1954) Pegmatite investigations, 1942-45, in New England. USGS Professional Paper 255. P Cristofono collection; Cameron, Eugene N.; and others (1954) Pegmatite investigations, 1942-45, in New England. USGS Professional Paper 255. King, V. (ed. ), 2009, Maine feldspar, Families, and Feuds; Cameron, Eugene N.; and others (1954) Pegmatite investigations, 1942-45, in New England. USGS Professional Paper 255.
ⓘ Ryerson Hill Quarries ? 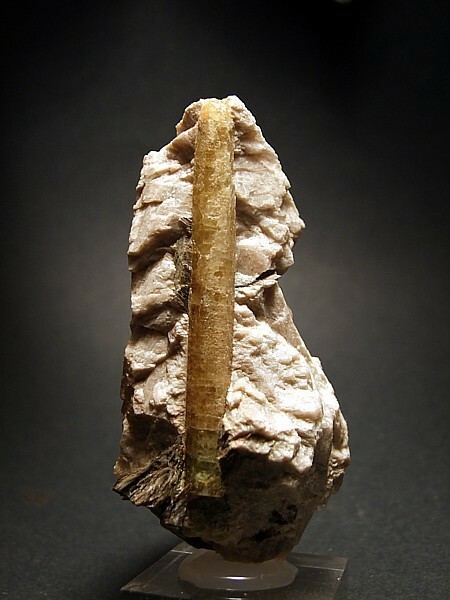 https://www.mindat.org/locentry-34500.html https://www.mindat.org/min-6727.html https://geology.com/gemstones/heliodor/ Morrill, P. (1974). Twenty Years Ago. Rocks & Minerals, 49(1), 3-10.
ⓘ Brown Thurston prospect ? ⓘ Butters Mountain locality ? Van King; Cameron, Eugene N.; and others (1954) Pegmatite investigations, 1942-45, in New England. USGS Professional Paper 255. Kunz, George Frederick (1890). Gems and Precious Stones of North America, p. 94. Sinkankas, 1989. Emerald and Other Beryls, p.555. Cairncross, B. (2004) Field Guide To Rocks & Minerals Of Southern Africa: 52. Cairncross, B. (2004) Field Guide To Rocks & Minerals Of Southern Africa: 53.